NASA recently unveiled initial images from the Solar Dynamics Observatory, or SDO, including images from a powerful ultraviolet instrument built at LASP. Launched on Feb. 11, SDO is the most advanced spacecraft ever launched to study the sun and its dynamic behavior. The spacecraft will provide images with clarity ten times better than high definition television and more comprehensive science data faster than any solar observing spacecraft in history. 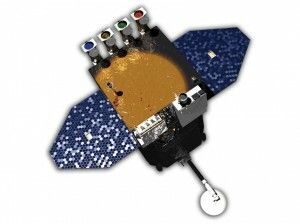 The spacecraft carries a scientific payload from LASP: The Extreme Ultraviolet Variability Experiment, or EVE. EVE monitors the sun where it is most variable — in the extreme UV part of the spectrum — and measures the spectrum every 10 seconds. At these wavelengths, the brightness of the sun can rise and fall a hundredfold within seconds, heating and “puffing up” the Earth’s upper atmosphere, which absorbs the high-energy UV photons. EVE measures these changes with unprecedented time and spectral resolution. The instrument was designed and built, in part, by engineers, scientists and students at LASP. Just eight minutes after a solar flare event, Earth’s atmosphere receives the full blast of flare radiation. The EUV radiation is energetic enough to break apart molecules and atoms to create our ionosphere. When our ionosphere is disturbed by a solar storm, we can have disruptions in our communication and GPS navigation systems—like the loss of radio communications experienced by Katrina relief workings during a solar storm days after the hurricane hit New Orleans. NASA, NOAA, and the Air Force will use EVE data to more precisely predict how each solar flare will change our ionosphere. With this information, scientists will be able to be proactive, instead of reactive, to the impact of these solar storms on our technology.